I was born in 1943 at St Monans Hospital – Cremorne? I went to Sunday School at the Congregational church in Belmont Road – now Uniting? To primary school at [then] SCEGGS Redlands. My mother and I lived in Central Ave [my RAAF father was posted missing WW2 – still missing]. There was a milk dairy at end of Medusa St and we had an ice box with blocks of ice delivered. We shopped at Spit Junct. in the greengrocer and grocery store where biscuits were in big tins, bought by the lb. Iced Vo Vo and milk arrowroot for example. Milk shakes for a birthday treat in the Spit J milk bar and penny icecream cones. Supermarkets came in the 1960s I think?? 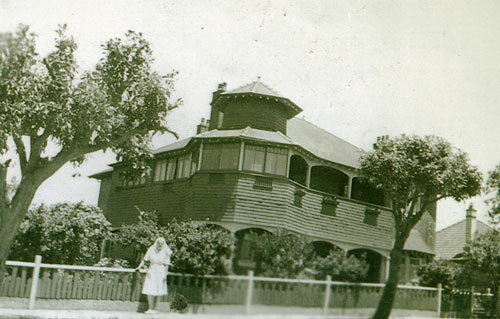 My father’s family had moved from Narromine to live in Muston St. nearer Mosman junction, probably 1920s. I often visited so knew and loved that area well. My aunt took me to still remembered productions of operetta and musicals at Mosman Town Hall and Legacy Christmas parties were held there for primary school age children whose fathers had died or were missing WW2. A bag of fruit and chocolates for my mother. We were entertained by a ventriloquist which I found disturbing! I remember the Scottish bagpipe bands marching down to Mosman from Spit Junction. In the 1950s we moved to Medusa St. when my mother remarried. A primary school was built across the road [Beauty Point infants] which my [half] siblings attended and there was still virgin bush down the road nearer middle harbour. The greengrocer and egg man delivered. I think the trams were still running as I remember them going to Balmoral and the Zoo. One tram went into the water at the bottom of the Zoo hill. Did trams go down to Mosman Bay ferry? The hair-raising ride in a double decker bus down to Musgrave St wharf. I also remember the long toil up Awaba St. hill walking home after swimming at Balmoral and the steep steps up from Parriwi Rd to Spit Rd after catching a tram home from town -as we called the city. Catching the ferry to the Quay sometimes for school [SCEGGS Darlinghurst] & College. Visiting Mosman library on saturday mornings. Now I live in UK. I always have a ferry ride to Mosman Bay when back in Sydney which is peaceful and picturesque on the Harbour. Hi. I also was born at St Monan’s, in 1950. We lived in Reynolds Street Cremorne and I attended Middle Harbour Primary school. We then moved to Clifton Gardens, from where I caught the bus to SCEGGS Redlands. I now live in Melbourne and just remember the trams at Mosman junction, I think they went in 1956. Of course we do still have trams here in Melbourne. The tram that went into the water at Athol Wharf – the conductor was a Sydney Uni Engineering student & the tram waiting at the wharf while the thirsty tram slithered past was also a Sydney Uni Engineering student – what were the chances of that? I was prompted inadvertently to Google St Monan’s Hospital. I was born here on 24 May 1954, delivered by Dr Begg. I had never seen a photo before or made a “pilgrimage” there, even though I spent a lot of my childhood and school holidays in Cremorne. We have two “family” recipes of biscuit slices that come from St Monan’s. A different home-cooked slice, biscuit or cake was served for afternoon tea each day, or so my mother used to say. My grandparents lived on Royalist Rd, so I suppose that is why I was born here, but I am not aware of the actual reason, especially as my sisters were born in larger hospitals closer to home, Glebe Point at the time. The Arts and Crafts architecture of Cremorne-Mosman-Balmoral is still my favourite. I too, was born at St Monans. It looked like a Victorian two-storey house or mansion, not like a hospital at all. However, it was a private hospital and the sort of place that appealed to those who could afford it. Small, quiet, secure with excellent facilities and superior patient comfort. I think Mum’s doctor was Bob Day, who had rooms in North Sydney opposite the oval in Miller St. I remember going to his rooms as a kid for checkups, shots and the occasional stitch. St Monans was at the Cremorne end of Holt Ave, just one or two houses back from Military Rd. Replaced today – of course – by a block of flats. The border between Cremorne and Mosman is Spofforth ST, so St Monans was in Cremorne. I too was born at St Monan’s Hospital in July 1930. At the date the address given on my birth certificate is listed as Raglan Street Mosman although it could be a mistake as my parents were living in Raglan Street at the time.. I moved to Melbourne when I was a month old. If someone could send me a photo of the hospital I’d appreciate it very much. Hi Jill, I also went to Middle Harbour around your time. One of my teachers was Mrs Hays. I too was born in St.Monan’s, Holt Ave, Cremorne. The private hospital was owned by my grandmother’s sister and her husband. They lived two doors down the hill in a Federation style building on a large plot of land, now units. They grew their own vegetables at the back and had a disused tennis court I think. The gentleman may have used a wheelchair. I can’t remember their names. I lived in Mosman Bay with my grandmother for about a year perhaps and attended Mosman Public School on Military Road. I think the trams did go down to Mosman Bay Wharf and the tram tracks used to be visible and maybe still are.